The Brotherhood of San Rocco grew up around a French-born medical student who renounced career and wealth to make a pilgrimage to Italy. He dedicated himself to helping plague sufferers and in the process became infected. Legend says that he hid in a forest, and each day a dog brought him bread until he healed miraculously. Upon return to France, he was not recognized by his family and died in prison at age 32, but he'd already planted a seed in Italy and a sect dedicated to San Rocco was recognized by the republic in 1478. The cult of St. Rocco, invoked against the plagues that decimated Europe, was particularly strong in Venice, and after the grave epidemic of 1576, the saint was made co-patron of the city. Generous donations to the brotherhood led to the construction of a church and one of the most sumptuous scuole in the city. Apart from being a great example of Venetian Renaissance architecture, the Scuola Grande di San Rocco is famous for a series of more than 60 paintings by Tintoretto that some have referred to as Venice's Sistine Chapel. More mystical and devout than his contemporaries, Tintoretto sought pathos and emotional tension rather than refined brushstrokes. He carried Titian's love of motion and unusual composition to highly dramatic ends: his wall-size Crucifixion left even tough-skinned critic Ruskin speechless. The story goes that in 1564 Tintoretto won the competition to decorate the Albergo of the scuola by submitting a finished work instead of a sketch. He offered the painting for free "not to win, but to honor St. Rocco" and spent the next 23 years on the cycle of paintings. Start from the Albergo on the first floor, which also houses two intense works on easels attributed to Giorgione and Titian. Then return to the large adjoining hall, where Tintoretto worked from 1576 to 1588, after the scuola agreed to pay him an annual pension for life. 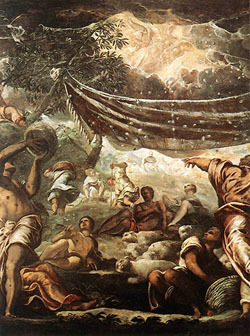 On the ceiling are episodes from the Old Testament; the three larger, central subjects are Moses Striking Water from the Rock to Quench the People's Thirst; The Brazen Serpent (serpent wrapped around a staff); and The Fall of Manna. These represent humanity's three bodily sufferings "thirst, disease, and hunger" which San Rocco and later his brotherhood worked to eliminate. The walls feature New Testament scenes and some conspicuous wood carvings by 17th-century sculptor Francesco Pianta. The mildly satirical, bizarre figures are allegories of the sentiments, such as Fury (the winged youth with the blindfold, flask of wine, and cannon); of activities like Espionage (the man wrapped in a large scarf); and of the arts, symbolized by a bad-tempered Tintoretto, with a bunch of brushes. The eight canvases on the ground floor, conceived when Tintoretto was in his sixties, show his innovative use of light and shadow, which play a key role in the economy of his masterpiece Flight into Egypt. The Old and New Testament works were restored in the 1970s, making all the more evident Tintoretto's inventive use of light.